Home » My Blog » Handmade » One Sheet…A Million Possibilities! On my search for quality handmade paper for my Save the Dates (I know! More wedding stuff! It has consumed me!) I came to the harsh realization that either you buy expensive handmade paper from an independent retailer OR you buy your basic cardstock from a Big Box store such as Michaels. Neither of which obviously appealed to me at all and I began to give up on the idea I would be able to find affordable handmade paper. But Alas! There is hope! In a last ditch effort, which I don’t know why it wasn’t even my first thought, I signed on to Etsy and searched for my desired scrolls of papyrus. Of course it was no surprise when 10000 products popped up! But when I specified my search a bit more, I stumbled upon some beautiful paper and some must mention stores. And not only beautiful, but affordable! I mean, really, what doesn’t Etsy have? I think I’m just going to start shopping for all my needs there! Check out the amazing products I found and find out which one I bought to create my Save the Dates! FYI: There are endless possibilities when it comes to paper. Scrapbooking, Card Making, Sign Making, Place Cards…name it and you can do it! How awesome is this handmade paper from torielliot! 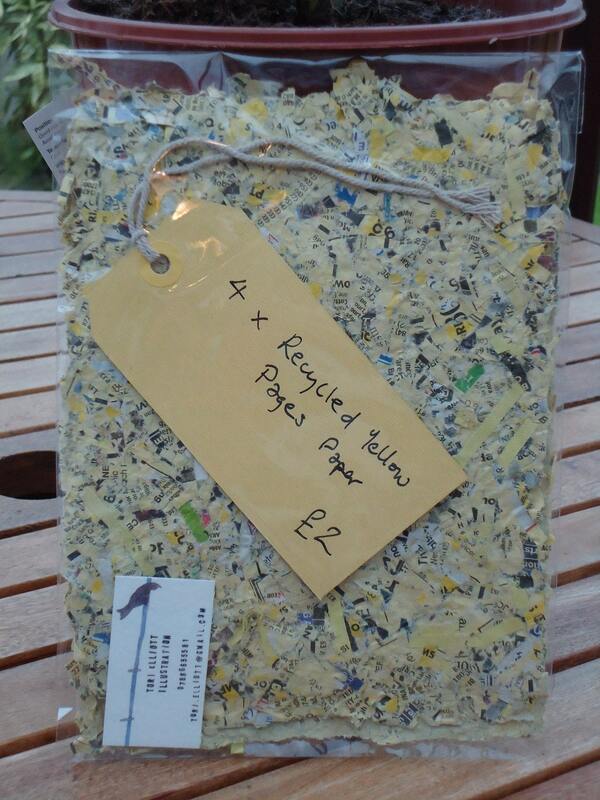 Made from recycled yellow pages paper, this handmade paper comes in packs of 4 and is perfect for scrapbooking. Original and ornate, these sheets of collaged scraps of paper are in themselves a work of art. To beautiful for you to write on? Stick them in an old frame and spruce up your walls. Imagine the conversations that would arise from them! The best part about these colorful sheets is that they are super affordable. Have a piece of handmade awesomeness for only $3.50 a pack! Amazing! Freshly brewed coffee paper! 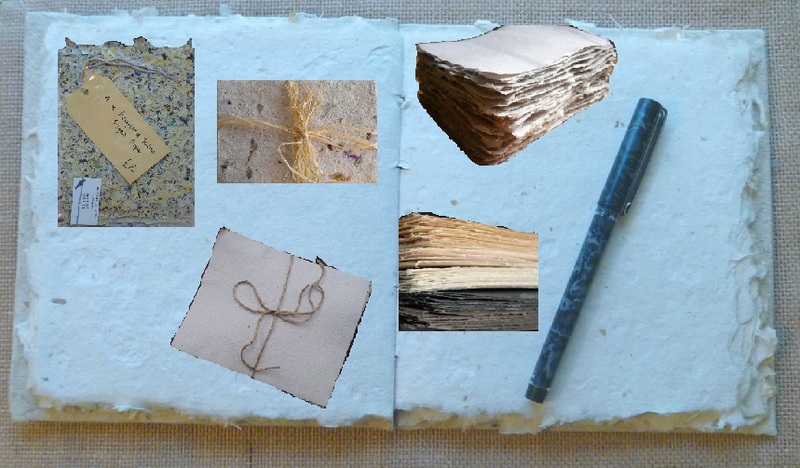 I loved reading that description when I stumbled across this coffee dyed handmade paper by secondhandwhimsy. It made me feel all warm and cozy on the inside just thinking about freshly brewed coffee. Well, more the smell really considering I don’t drink coffee. But not for a lack of trying! I just never took to the taste. Back to the paper though! 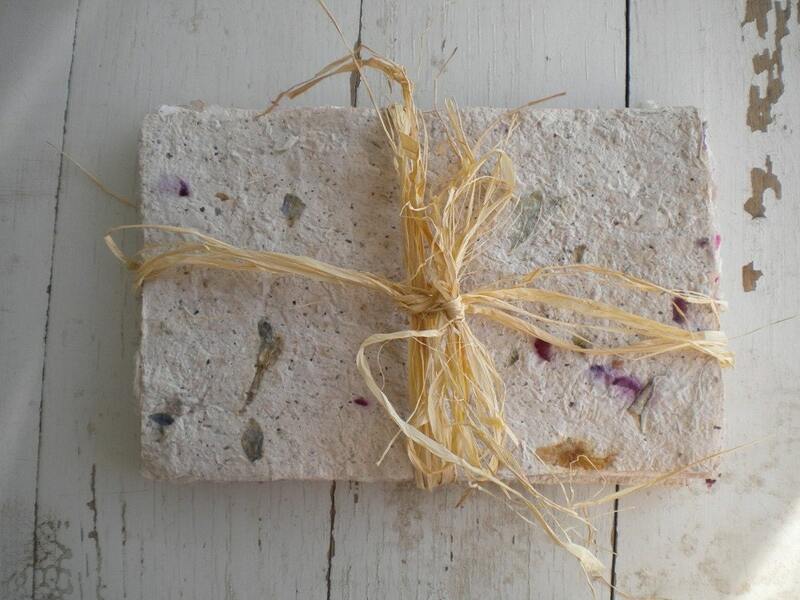 Handmade from recycled office materials (talk about conserving!) these parchment sheets can be made with or without grounds embedded. Sold in packs of five and hand tied with twine. How cute! Besides being pretty, these beautifully twined handmade sheets of paper put the “eco” in “eco-friendly.” Combining the usual leftover scraps of our paper worked lives, this lovely stationary includes a rather unique feature….flowers. Yes, dried flowers. That’s what those little specs of color you see are. How cool is that? Not to mention that sheepstreetdesign also creates its handmade papyrus with tea; an indulgence that I could not live without! Perfect for scrap booking, card making or whatever fun project you may have in mind! Bare witness, my friends! These are the sheets of handmade goodness that started this whole debacle! I was in a desperate search for paper that would make my Save the Dates POP! And cardstock was just not giving me the effect that I wanted at all. Way to rigid and it was just not fitting in with my vintage theme! 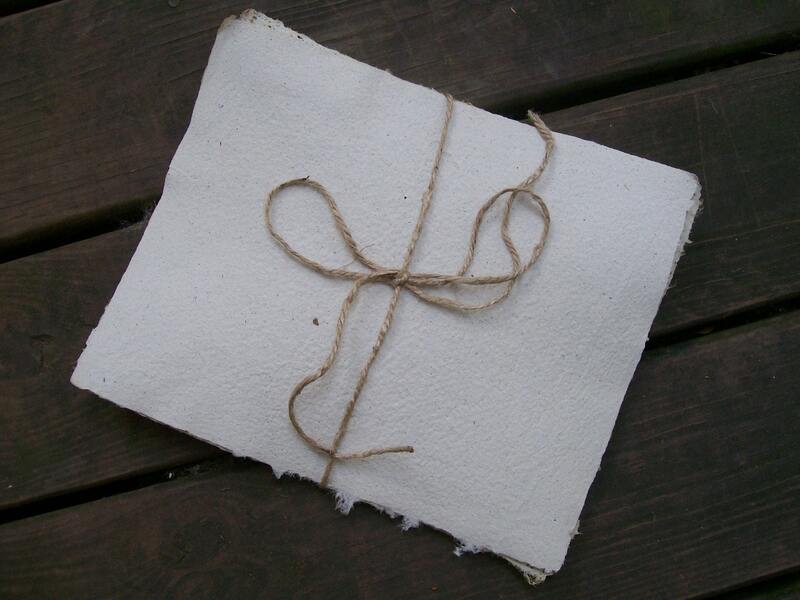 So, I realized that I needed some amazing handmade paper…something that would scream rustic. And after searching in shops, I realized I should just try Etsy and VOILA I find my perfect match at WhiteDragonPaper! Made from 100% cardboard, paperboard, and scraps of magazine pages this set of brown handmade paper is 4×5 and comes in a range of pack sizes. To give you an idea, I got 40 sheets for $10! How amazing is that! I never thought that I could get quality handmade materials for affordable prices! So excited to get started on my Save the Dates when it arrives! Fun detail about shop: If you accumulate lots of scraps, send them to me for up to 25% off any item in my shop! If I was a goat, this delectable handmade cotton paper would be my Filet Mignon! Available in 5 delicious colors, these sheets are ” solid,” as the seller puts it. What the seller says: These papers are what we call luster, which means they glisten just slightly, nothing too overpowering, but enough to add the wow factor to any project you might be working on. Paper size is 19″ x 25″ and has 4 natural deckles. The paper is one hundred percent cotton, internally sized and buffered, a heavy wight paper great for a range of artistic purposes. Just imagine the possibilities! Journal writing is a favorite past time of mine and I always challenge myself when finding a new journal to purchase something unusual and unique. Just like me 🙂 I love buying leather bound or handmade journals, but they naturally be super expensive. 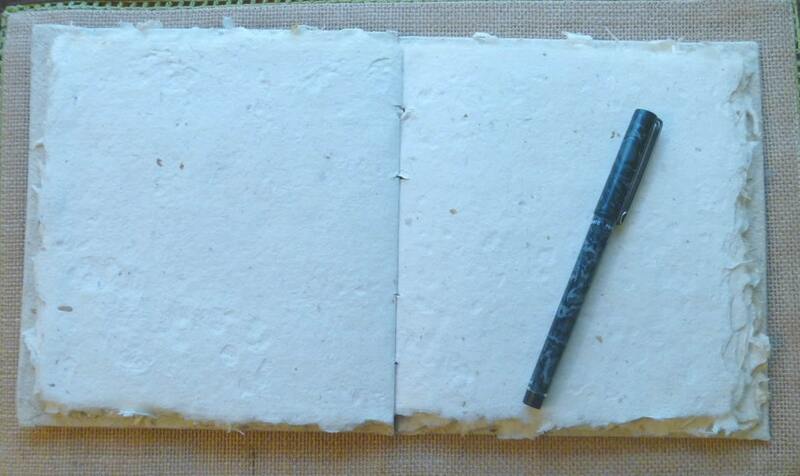 So when I stumbled across this handmade paper journal from hyperdoggie I was relieved! Beautiful and priced well, this journal is handmade inside and out. The book has a lovely cover with natural paper made from gourd vines, and decorative papers and beads have been added in natural tones to dress up the cover. 20 pages inside are sewn as signatures, and each has graceful deckle edges. Lovely. That coffee paper sounds really neat! ← Christmas Tree Oh Christmas Tree!